I'll be honest. I was gone at a conference for the last four days and came home with allergies or a cold that put my head in a fog. Basically I didn't have the time, energy, or clarity to be super unique for today's lunch. In other words, I had a parenting week that I'm sure you all can relate to. After a busy weekend sometimes you can barely get yourself together enough to make a lunch, much less a fun and creative one. I get it. I understand. It happens. So today's lunch can be put together in a matter of minutes. Seriously, you should try it for yourself you might be surprised how easy it is to make. Every once in awhile quick and simple is best. Well, the good news is that the holiday season is just getting started so it is pretty easy to come up with some themes. I will throw some Halloween ideas out there for you over the next few weeks. 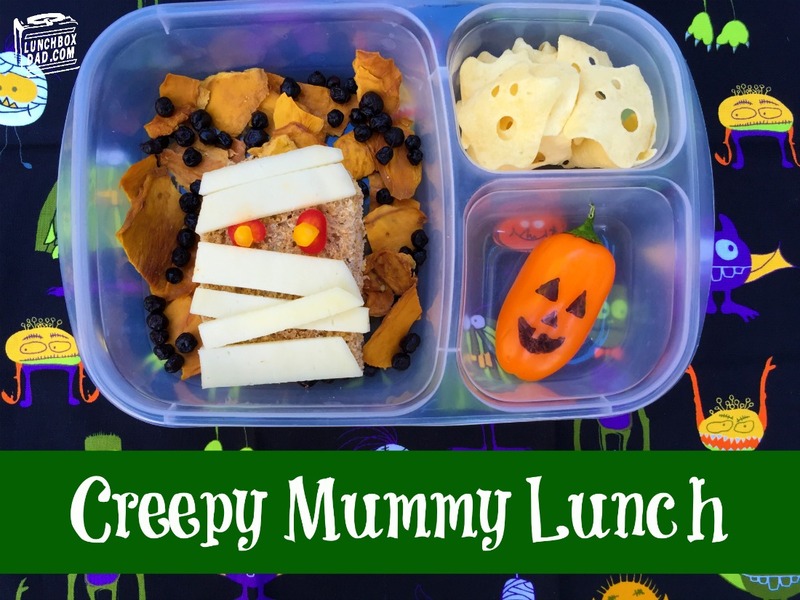 Today's is a Creepy Mummy Lunch for no other reasons other than it sounded fun, I had the food, and and it was easy. 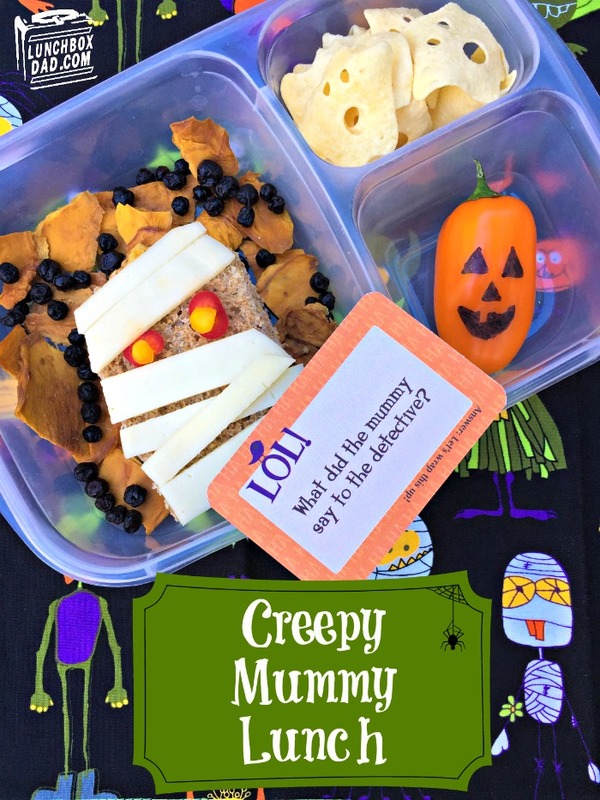 I made it in an Easy Lunch Boxes container with a Halloween themed Lunchbox Love note. Make sure and follow me on all my social media channels so you don't miss a thing! 1. Cut slice of bread in half and cut off crust. place turkey in the middle of the slices of bread. Slice cheese into strips and cut two small pieces of red sweet pepper and two smaller pieces of yellow sweet pepper. 2. Arrange the cheese on top of the bread like strips of mummy cloth. Optionally you can "glue" them on with a little mustard. Place the red and yellow pepper pieces where shown for the eyes. You can use mustard to "glue" these as well. 3. Place sandwich in main compartment and surround with pieces of dried mango and dried blueberries. This gives it an orange and black "Halloween" look. 4. Use a black food coloring marker to draw a jack-o-lantern face on an orange sweet pepper. Place in a side dish. 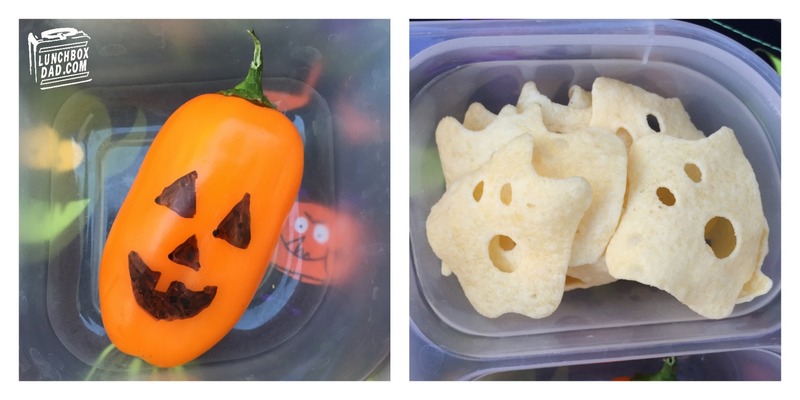 In second side dish place ghost shaped Boo Chips. I bought these at Whole Foods, but you can probably find them another place or substitute in a similar Halloween shaped snack. 5. 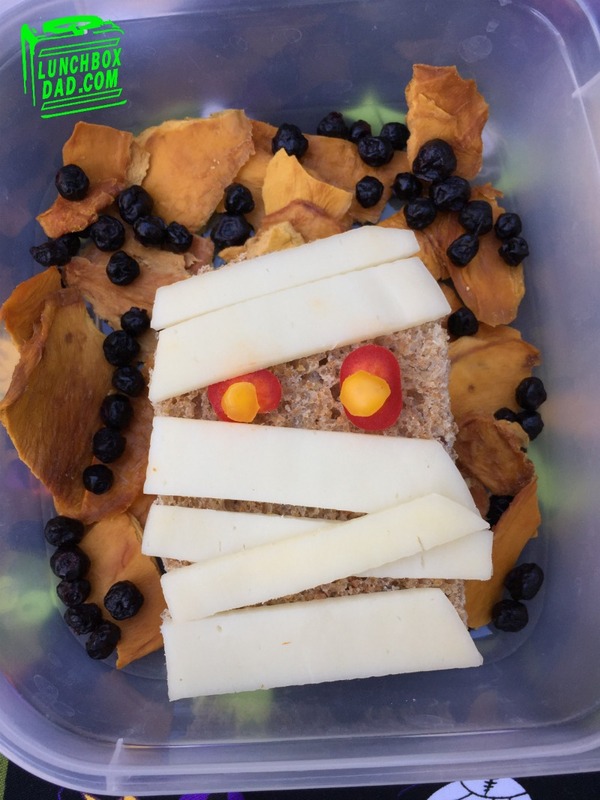 If desired, use a Halloween Lunchbox Love note to finish the lunch. They have all sorts of options and kids love them!